Storage space in bow and Stern with stainless steel d-rings for tying down Dry bags and gear. Kayak total weight capacity: 400 lbs. Super-tough laminate material with polyester core for high strength and durability, ensuring high impact and abrasion resistance, while retaining light weight and portability. High pressure inflation provides extra rigidity and stability, with high pressure spring loaded valves for easy inflation and fast deflation. 3-Ply super tough construction employs a high molecular PVC that is unaffected by gasoline, oil and Salt water. It is highly resistant to damage from abrasion, impact and sunlight. It also permits more air pressure for rigidity.. includes: two (2) specially designed removable skews for optimal maneuverability through deep and shallow WATERS, two (2) floor mounted footrests, two (2) integrated recessed fishing rod holders, two (2) adjustable bucket seats. Removable and adjustable mounting bracket for additional accessories, such as GPS systems, fish finders, swivel fishing rod holders, etc.. storage space in bow and stern with stainless steel d-rings for tying down dry bags and gear. Weight capacity: 400 lbs. 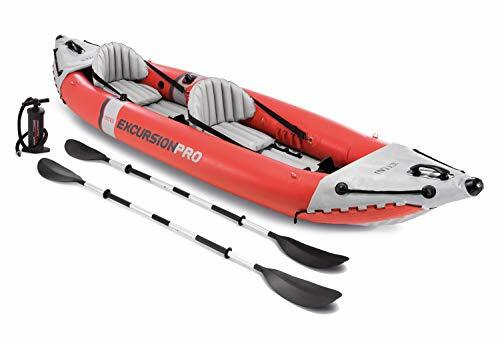 Intex 2 Person Inflatable Excursion Pro Kayak w Aluminum Oars & Air Pump 68309EP -- Professional Series, Oars, Pump, Rod Holders & More! 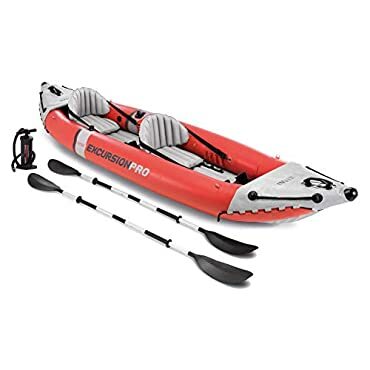 Intex 68309 Excursion Pro Inflatable 2 Person Vinyl Kayak with Oars & Pump, Red -- Free 1-3 Day Delivery With Hassle-free, 30-day Returns!